Last night after work I went to see Mr. Holmes, starring Sir Ian McKellen as Sherlock Holmes. I mentioned before this was the movie I most wanted to see this summer. Back in March I read the book on which the film is based — Mitch Cullin’s A Slight Trick of the Mind — and I liked the book a lot, finding it a moving and haunting piece of work. It’s not really a mystery in the traditional Holmesian sense. Part of the narrative resembles the classic Holmes set-up — the client upon the stair, some investigation, some deduction, and a resolution — but the novel is much more than that. It’s a meditation on memory and the stories we tell (and believe) to make sense out of our lives, the unknowables in life, about the places where the powers of the rational mind cannot take you. It’s an internal book with an unreliable POV character, and I wasn’t sure how well it would translate to screen. Mr. Holmes is the story of Sherlock Holmes, aged 93, and it unfolds in three time periods — Sussex, the summer of 1947; Japan (in particular, Hiroshima), a few months earlier; and London, 1919. (In the book, the London plotline takes place in 1903, just before Holmes’ retirement. The movie makes some changes to the chronology of Holmes’ career, probably so that McKellen could convincingly play the younger Holmes.) In the “present” of the film, the summer of 1947, Holmes returns to his cottage on the Sussex Downs where he is studying bees and the recuperative powers of the Royal Jelly. He is also struggling to recall the details of a case he handled at the end of his career as a detective, a case that involved a husband, his bereaved wife, and a glass armonica. Something about that case caused him to retire, but his memory is failing and he cannot recall the details. With the help of the Prickly Ash (gathered in his Japanese trip) and his housekeeper’s young son, Holmes tries to piece together the fate of Mrs. Anne Kelmot. The story translates translates well. 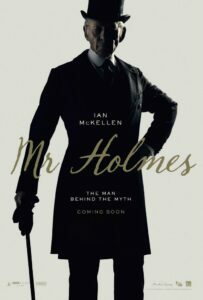 Mr. Holmes is a good adaptation of the novel’s storyline and all three of its narrative threads, with changes that are largely appropriate for translating the book to the screen. Mrs. Munro, the housekeeper played by Laura Linney, has a more prominent role and more character moments. And Roger, Mrs. Munro’s ten-year-old son (played by Milo Parker, who looks like a very young Thomas Sangster) has a deeper relationship with the movie Holmes than he does with the book’s Holmes — surrogate son, friend, assistant, confidant, pupil. The performances from the major characters are all strong. McKellen does well with Holmes at two different ages and makes them different; the sixty-year-old Holmes is cold and detached, the elderly Holmes is warmer and more human. I was especially impressed with the quick mental turns McKellen conveyed as the 93-year-old Holmes; he goes from sharp to catatonic and back, as dementia patients often do, and he managed the physical change that comes from that mental whiplash as well. (My grandmother suffered from dementia that last decade of her life. I saw a lot in McKellen’s performance that I recognized from personal experience.) I was very impressed with Parker; he held his own on screen against McKellen and Linney, with a scene where Roger demands that Holmes perform a deductive trick on his mother as exceptional and noteworthy. For me, the film’s most emotionally affecting moment was the visit of Holmes and Umuzaki, his Japanese corespondent, to the burned ruins of Hiroshima, especially when Holmes sees the Genbaku Dome, the famous burned building at ground zero that survived the blast. Curiously, I wasn’t moved when the book’s most affecting moment happened, perhaps because I knew it was coming. McKellen’s Holmes is closer to Jeremy Brett or Jonny Lee Miller than Benedict Cumberbatch or Robert Downey, Jr. He has feelings, even if he can’t always express them or understand them. I liked this film a lot. It’s well acted, well directed, and has solid production values. It’s not hyperkinetic like Robert Downey Jr.’s films or Sherlock. It’s thoughtful. I’ll gladly add this to my collection when it comes out on DVD.